Ebola cures are currently on hold, as too few people have been infected by the deadly virus to make production of curative drugs profitable to pharmaceutical companies. Ebola, also known as EVD, has been named the world’s deadliest disease. The U.S. government fears EVD could one day be used as a biochemical weapon against citizens in the United States. Even with concerns of EVD being used in a biochemical weapons attack, pharmaceutical companies do not appear to be interested in bringing the curative drugs to market. There are several strains of EVD, which is one of many hemorrhagic fevers. Hemorrhagic fevers have afflicted people around the world for a very long time. Cases of hemorrhagic fever have appeared in several countries throughout the world. Ebola, Marburg, Lassa, and Crimean-Congo hemorrhagic fever viruses are some of the most widely known. Hemorrhagic fevers have infected people in Europe, North and South America, Asia, and Africa. In comparison with other diseases, they infect very few people. These viruses are not airborne. To become infected, a person must come in direct contact with the bodily fluids of an infected person or animal. The number of infected people is a motivating factor for prescription drug companies to develop a virus fighting drug. Ebola was discovered in 1976, since then there have only been 3,392 reported cases of humans being infected with EVD. Of the reported cases, 1,834 people have succumbed to the disease. Those numbers are not large enough to motivate pharmaceutical companies to invest heavily in vaccines and anti-viral medications to treat hemorrhagic fevers. Several antiviral treatments and vaccines have proven to be effective against EVD in a laboratory setting. However, these cures are on hold because too few EVD infection cases exist. One vaccine has proven to be effective in fighting Zaire Ebola, the most fatal strain of the virus. Zaire EVD is currently infecting people in Guinea, Sierra Leone, and Liberia, in Africa. A study conducted using small animals suggests a medication, called Favipiravir, could be an effective treatment during the late stages of EVD infections. The study, titled Successful Treatment of Advanced Ebola Virus Infection with T-705 (Favipiravir) in a Small Animal Model, found that the drug, Favipiravir, “prevented a lethal outcome in 100% of the animals” tested. Another study found a broad-spectrum vaccination to effectively prevent EVD from infecting vaccinated human cells. It is important to note that pharmaceutical companies are businesses and they are in business to make money. If the risk or cost of developing, testing, applying for FDA approval, and manufacturing a specific drug is too high, drug companies will not move forward with that particular drug. At this time, that is the case with cures for Ebola, which are on hold, because there have not been enough people infected by the deadly virus. Major drug companies do not believe that focusing on medications to fight EVD and other hemorrhagic fevers is a profitable endeavor. Pharmaceutical companies’ concerns are more than financial. 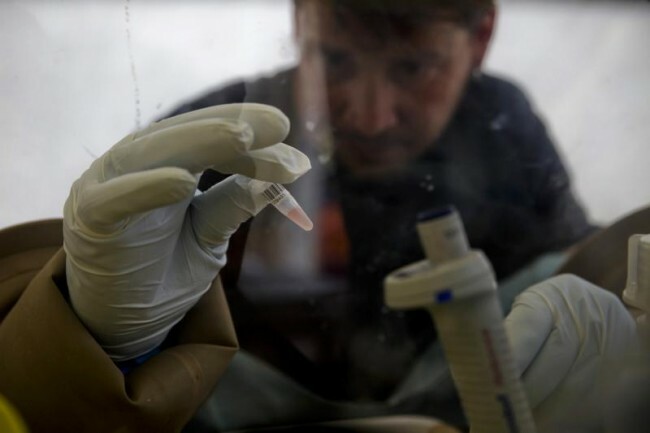 Side effects of testing Ebola fighting drugs on healthy humans is another concern. There is always a chance a drug will have different effects when given to humans, than it did during animal testing. The drug could infect a healthy person, instead of protecting them from the virus. Finding healthy people willing to be given a vaccination, which introduces antibodies for an extremely deadly disease, is not an easy task. People infected with EVD generally die within one to two weeks from the time they start showing symptoms. EVD outbreaks are fairly infrequent when compared to more common illnesses, which humans can live with for many years. With few outbreaks and Ebola patients dying so quickly, finding candidates to test the drugs presents a problem. These are all valid concerns and represent challenges that pharmaceutical companies must carefully resolve. There are many other diseases that affect far more people. Drugs for the treatment of more common diseases still need to be developed. So, right now, those illnesses are a priority over EVD. A major outbreak in the U.S. or Europe may change this. If EVD threatened a larger group of people, in a more populated and developed country, there is a good chance treatment drugs would be pushed through. The current outbreak in West Africa will probably motivate smaller labs to conduct additional testing, but a viable treatment for the disease will most likely not be available for years. Unfortunately, a cure or vaccine for humans infected with Ebola will likely be on hold until more people have been infected by the deadly virus. 4 Responses to "Ebola Cures on Hold, Too Few Have Been Infected by the Deadly Virus"
“Favipiravir) in a Small Animal Model, researchers tested this drug on small animals, and found that it prevented Ebola infection in all the animals tested.” This should at least be given to everyone who HAS ebola! So, if it doesn’t work, they die anyway… As for blaming the drug companies for not taking this on. Any number of governments could finance a study as in a grant. Why should any drug company take on this task for free at great risk to their employees? Those poor people over their aren’t suffering because of our greed. They are however, eating bats, washing dead bodies, hiding the truth of their contact from health care workers. And hiding the sick to infect entire families. And yet once again if anything goes wrong anywhere in the world, Obama’s name comes up. I imagine he is also responsible for the great plagues of Europe. “Cure” being a relative term as it is a virus and you will retain antibodies of the virus in your body for the remainder of your life. And once again MONEY and BIG BUSINESS win over the well-being of human beings! It’s in Africa, so there may be 1,300 people infected, but who cares? That number is too small. But, oh, if there is an outbreak in the U.S. or U.K., then I guess it would be worth the time to develop one – never mind that you have 3 different options for vaccines and a cure being developed in Texas with a near 100% success rate as we speak. But, we can’t make any money off those African people because they’re poor, so let’s hold off on making a vaccine for awhile, even those this is in the top 3 category of most dangerous diseases on earth. And while it may not be airborne, it’s not difficult to catch either. Those poor people over there suffering because of our countries’ greed. Yet, Obama can spend $3.6 billion on illegal immigrants so they can stay in the U.S., no problem. What hypocrites. Disastrous. But unfortunately entirely understandable. Why should a profit seeking company embark on dangerous and costly testing for a drug which I will make a loss from?